NEWTON – With only a little over 24 hours left until the start of Election Day, Governor Chris Christie made his way to Sussex County on his bus tour of the Garden State, a tour of which Sussex County is one of over 90 stops in a six day period. The crowd, though small, started to gather around 3 p.m., and then began to multiply, to about 200 or more, who huddled together on the sliver of lawn on the Union Place side of the Republican Headquarters property on Trinity Street, with the Christie supporters flowing over onto Union Place itself. The small street that connects Spring and Trinity Streets, was closed off to traffic. Slightly after 4 p.m., the Governor’s bus rounded the corner from Spring Street, and descended the hill on Union Place, stopping to let the Governor off, just before the podium. After greeting those there waiting for the governor with a beep of the bus horn, the Governor stopped to greet dignitaries who were waiting for him, and pose for photos, before making his way to the podium. Not everyone who was in attendance was a fan. A small group of protestors formed across the street on Trinity Street, protesting environmental concerns, including the Fenimore Landfill in Roxbury, and about fracking. 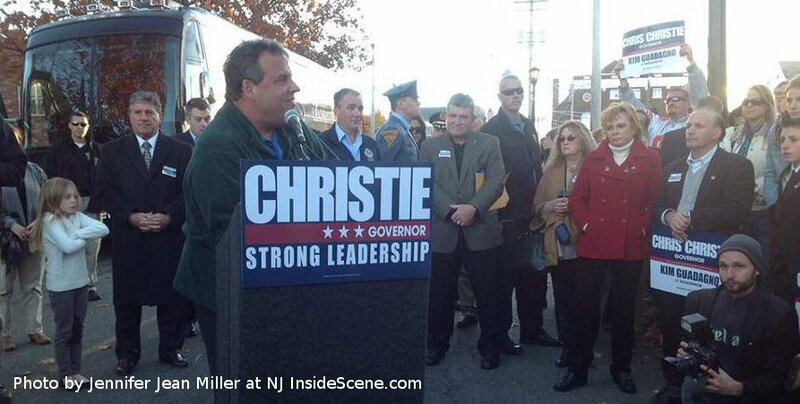 Christie acknowledged the protestors, as he is often known to say something to those protesting. “There are the forces that will always fight against us,” said Christie, in recognition of the dissension. Christie said he is hearing from those that he meets from across the state, that they recognize that government is working together, and expressing that they are proud to be from New Jersey. Christie said that on Tuesday night, he expects to have a share of the Independent vote for the state and approximately one-third of the Democratic vote. As he said that, Christie recognized a resident who toted a sign, which read “Democrat for Christie.” He invited that Democrat, Melissa Allan, to the podium, beckoning her over, giving her a hug, and a kiss on the cheek. Allan, who arrived in Newton early for the event, stopped by the Republican Headquarters, and even volunteered some of her time to helping the group call constituents. Click here to view the story about the Lieutenant Governor’s visit. Stay on the scene with NJ Inside Scene, as we take you through the election. And, check us out on Facebook!